"I'm going to be a writer." It is often said that those born with the gift of creativity must suffer for their art, but few biographies rival that of Janet Frame, New Zealand's most famous author. Hers is a story of isolation, tragedy and, ultimately, redemption. She was born into a poor railway family in the southern town of Dunedin in 1924. An extremely shy girl, she developed a love of writing at an early age, but her dedication to her calling alienated her from those around her. After suffering a nervous breakdown as a young adult, she was institutionalized in 1947, misdiagnosed as an uncurable schizophrenic, undergoing horrendous and barbaric treatments before her talents were recognized. In the end, it was her writing that saved her. Between 1982 and 1985, Frame published the trilogy of installments that comprise her autobiography, To the Is-Land, An Angel at my Table, and The Envoy from Mirror City. Like many New Zealanders, director Jane Campion (The Piano, The Portrait of a Lady) discovered Frame's writing as a young girl, and became fascinated with her story. This biography, originally shot as a three-part television miniseries mirroring the source material, would cement the director's reputation as a woman to watch, and for good reason. An Angel at My Table is a triumph in independent filmmaking. Set against the stunning New Zealand landscape, the film was shot on a modest budget with an expansive cast, with three lead actresses portraying Frame from childhood to maturity. The first sequence, To the Is-Land, introduces Alexia Keogh as the frumpy, shy young girl with a mass of red hair, growing up with her sisters and epileptic brother in a small rural community. Her abillities are rewarded with access to the library, where she becomes more and more involved in the magic of wordsmithing. Karen Ferguson takes over as the adolescent Frame, finding it increasingly difficult to relate in a social context with her contemporaries, while also dealing with a series of family tragedies, pushing her further and further into her writing. Kerry Fox assumes the role as Janet, now a young woman, prepares to head off to college to become a teacher. The second act, An Angel at my Table, finds Janet away from home, living with her aunt and uncle while attending classes, still challenged by her introverted nature to the point of mental collapse. She is shipped off to Seacliff Mental Hospital, where she would spend the next eight years of her life undergoing experimental electroshock therapy until word arrives that she has won a literary prize for her debut collection of short stories. Now a published author, and leaving New Zealand behind, The Envoy from Mirror City sees Janet expanding her experiences in the world, as the door opens on a new life in England and Spain. There is a brutal honesty and vulnerability that comes across as Campion brilliantly balances the elements of the story, including the bridging the change of actresses midstream. The casting here is impeccable. All three lead actresses give fantastic performances, but it is Fox's performance that elevate this to masterpiece level. Completely convincing in the part, she gives her character a wonderful breadth, conveying an emotional depth that is nothing short of flawless. Visually, the coarser 16mm film grain and the deliberate use of varying color temperatures to enhance the mood at any given time add another layer, from the vivd, highly contrasted exteriors to the somber, and almost monochromatic sequences as Jane wrestles with the tragedies that life has dealt her. Everything works together to give the film an air of authenticity, from the performances to the sets, costumes, and compositions. 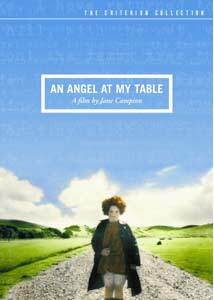 An Angel at My Table is an immersing, compelling story, expertly adapted to screen. Image Transfer Review: Criterion presents An Angel at My Table in a new, director-approved widescreen transfer, supervised by cinematographer Stuart Dryburgh. Image quality is extremely good, with rich, well saturated color, deep blacks and good contrast. The image has been cleaned up substantially, but does not lose its filmlike appearance, with a fine grain present throughout. The look isn't overly sharp, but the detail level is natural. Although this is an approved transfer, the film was originally shot for television, which means the composition, especially head space, is compromised in this cropped widescreen version. Several times the tops of the actor's heads are lopped off by the framing, and there is a somewhat cramped feel, which is noted by Dryburgh in the commentary. Audio Transfer Review: The 5.1 audio track is clean and free of any technical deficiencies. The soundfield is immersive and natural sounding. For the most part, dialogue is easy to discern, the only difficulty being that of accents on occasion. Extras Review: Criterion provides a nice assortment of supplemental material for this release. The commentary track features director Jane Campion, director of photography Stuart Dryburgh and actress Kerry Fox. Presented in Criterion's typical edited format, the combination of talent allows a thorough look at the making of the film from different angles with no dead air, despite its two-and-a-half hour runtime. A making-of documentary (10m:23s) from 2002 focuses on Campion, how she was introduced to Frame's work, and why she chose to bring the story to the screen. We see Campion in the editing suite, during voiceover sessions with actress Kerry Fox, and at press conferences for awards ceremonies. Also included is a 1983 audio interview with Janet Frame for New Zealand radio, coinciding with the release of To the Is-Land. This feature runs approximately 23 minutes. A stills gallery spotlights the crew and author, rather than publicity shots. Title cards indicating the subjects are presented before each series of photographs. The theatrical trailer round out the on-disc extras. The package also includes a 40-page booklet, which in addition to credit information, contains an essay on Frame by editor and author, Amy Taubin, plus three extended excerpts from Frame's autobiographical trilogy. There are some films that can leave an indellible impression, even if only seen once, and An Angel at My Table falls in that category. Highlighted by a breakthrough performance from Kerry Fox, Jane Campion delivers a stunning portrait of New Zealand's most notorious author. Very highly recommended.